PROFESSIONAL DEVELOPMENT BUILT BY LEADERS FROM HUBSPOT, PINTEREST, AND MORE. BUILT FOR TOP PERFORMERS AT LEADING COMPANIES. The Reforge Advanced Growth Strategy program extensively covers one of growth's most impactful frontier topics. By the end of the program, you will accelerate growth in your company and career by building detailed qualitative and quantitative growth models that will communicate how your product grows, its biggest constraints, and how to unlock growth by expanding or adding loops. The program is designed for both senior B2C and B2B practitioners and those in leadership roles. You'll analyze dozens of up-to-date and relevant examples, and apply the learnings on your product. This curriculum is designed so practitioners can participate anywhere in the world. Featuring: Our last session featured top growth leaders from companies including Pinterest, Grubhub, Uber, Zynga, Slack, Eventbrite, SurveyMonkey, Wish, HubSpot, Square, Greylock Partners and others. Brian Balfour is the Founder and CEO of Reforge. Most recently, he was the VP Growth @ HubSpot. Prior to HubSpot he was an EIR @ Trinity Ventures and founder of Boundless Learning (acq by Valore) and Viximo (acq by Tapjoy). He advises companies including Blue Bottle Coffee, Gametime, Lumoid, GrabCAD, and Help Scouton growth and customer acquisition. Casey Winters is a former Growth Advisor in Residence at Greylock Partners, Growth Lead at Pinterest and first marketer at Grubhub. He advises companies including Tinder, Eventbrite, Reddit, Canva, Pocket, and others on scaling and growth, specializing in retention and engagement. Kevin Kwok is a former Investor @ Greylock Partners, where he focused on marketplaces, autonomous vehicles, and crypto. The stuff that Brian Balfour is teaching is what should be taught in universities. 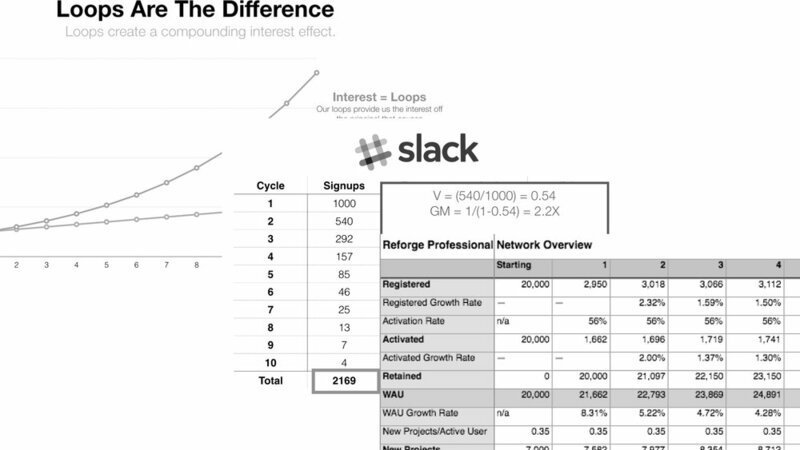 What are the exact loops that powered explosive growth at companies and products like Slack, Fortnite, Stripe, Dropbox, Glossier, and others? And what are the building blocks of those loops you can translate to your company? If you were leading growth at Instagram, Airtable, Front or Tinder, how would you use your growth model to set goals, prioritize experiments, and draw insights from the results? We walk you through examples from companies like the above, and many more. If you want a laundry list of tactics like "send cart abandonment emails on Thursdays" this program isn't for you. The Advanced Growth Strategy is designed to help practitioners apply the core elements of loops and modeling so that you can develop winning strategies specific to your current and future companies and roles. The three qualitative properties in every growth loop. The step-by-step process on how to identify these qualitative properties for your product. "The Growth Series got me thinking on a macro level about how a company functions and the different levers my team can impact to make a true difference. I was able to network with people from many companies I admire, and I learned from their challenges (many of which were similar to my own). Overall, it was hard but rewarding. It felt like being in a mini MBA program -- the material came at us quickly but the discussions were lively and motivating. I'm going through the material over and over now that the course has ended!" "I was very impressed with the depth and structure of the content and discussions. I left each session of the Growth Series with newfound knowledge, ideas, and real strategies I could begin working on the next morning. The case studies, real-life examples and discussions with seasoned growth leaders rapidly took each week's content from theory to application. While the concepts are powerful in the abstract, actually applying them or hearing how others applied them takes the learning to a whole new level. I was a bit worried it would be too much about virality and "hacking" growth, which most of us can't apply in our businesses (especially here at Google). To my surprise, the topics provided coverage of all aspects of growth -- from business strategy and pricing, to user psychology, paid acquisition, activation, retention and more. None of this was 'hacky.'" Good question — we know the Reforge program is a serious commitment. So if you're looking for the latest hacks to 10x your activation rate or 7 lessons after acquiring 1mm customers, then the Advanced Growth Strategy program won't be worth it. Also, if you're interested in a credential or logo to tack onto your LinkedIn profile, then the Advanced Growth Strategy program won't be worth it. However, if you're looking for frameworks you can apply directly to your company, step-by-step walkthroughs of dozens of current, relevant examples, taught by growth leaders who spent years in the trenches AND weekly events where you can connect with actual growth practitioners... then yes, this program is worth the commitment. How is the Advanced Growth Strategy program different from the Growth Series and the Retention + Engagement Deep Dive? The Growth Series provides a comprehensive overview of all the major topics in growth, from acquisition to user psychology. The Advanced Growth Strategy program is designed for emerging growth leaders who are 5+ years into their career. A leadership role and influence over the company roadmap is a bonus as well. The Growth Series and Retention + Engagement Deep Dive are designed for mid-career Product Managers, UX, Marketers, Analysts, and Engineers who are 3+ years into their career. If you already completed the Growth Series or have an advanced understanding of growth fundamentals and want to better understand the systems that drive growth for your company and others, then Advanced Growth Strategy would be a great fit for you. Is the content in the Advanced Growth Strategy program only for data analysts? The program is built for roles like VP Product, Sr. Product Manager, Sr. Marketer, Data Analyst, Engineer, or an executive working on growth initiatives. Participants with at least 5 years of work experience and/or at least 3 years working on growth initiatives will get the most out of the program. The team hand reviews every application submitted to make sure each person's work role, company, and level of work experience is a fit for the program as well as the other attendees. Last fall we received over 4,000 applications, so this process takes a few weeks. Every applicant gets a response, so we appreciate your patience as we complete the review. There's a ton of excellent online content around Growth, Retention, Acquisition, Activation, and more. Much of it is for free and we encourage everyone to check it out (in fact, Brian, Andrew, and Reforge have curated and linked to this free material often over the years). With that said, when it comes to Advanced Growth Strategy, the answer is no. This is a frontier topic, meaning that 80% of this material is still locked up in the minds of top growth practitioners. To the best of our knowledge, this is the first time these concepts have been codified and made applicable at scale. In what timezone will the live online events be held? We offer our live online events in the mornings, Pacific Time. If you can't join during that time, all sessions are recorded, and our community and online discussion forums provide global time zone coverage. It is possible to attend the program remotely and asynchronously. Weren’t previous Reforge programs 8 weeks long, not 6 weeks?